Connecting to the Integration Services service on the computer "localhost" failed with the following error: "Access is denied." By default, only administrators have access to the Integration Services service. On Windows Vista and later, the process must be running with administrative privileges in order to connect to the Integration Services service. See the help topic for information on how to configure access to the service. I am not sure why but I am the domain admin and have full rights over the server. Also why when I connect from my Desktop it can successfully connect, only if I connect from the server itself which gives me this issues. How do I fix this so that I can make SSMS on the server connect to its Integration Services instance. As I understand it, User Access Control, or UAC, can basically intercept requests for your group membership so in this case, it appears it was preventing your membership getting passed to SQL Server. Others have noted in their comments that you may still need to right click and run SSMS as an Administrator. This should take care of problem for now. (With this you need to always repeat the same process). To avoid this every time and for a more persistent solution you need to get permission(s). Please do the following process and you should be good. In previous versions of SQL Server, by default when you installed SQL Server all users in the Users group had access to the Integration Services service. 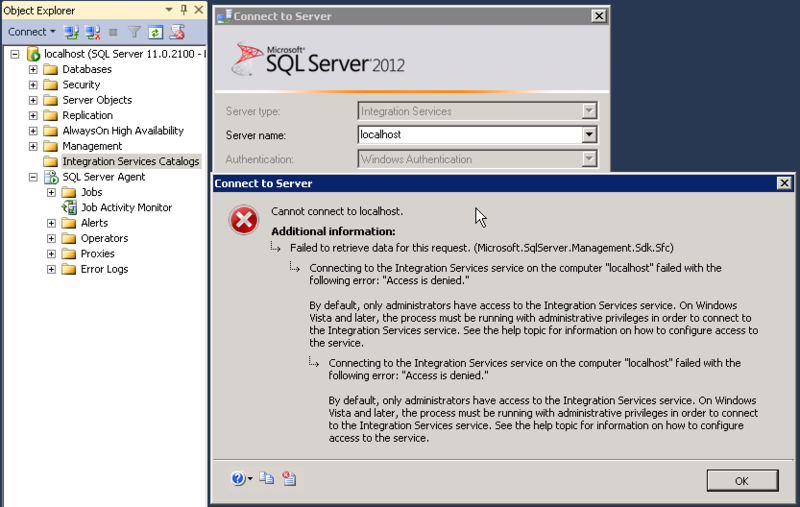 When you install the current release of SQL Server, users do not have access to the Integration Services service. The service is secure by default. After SQL Server is installed, the administrator must grant access to the service. You should check to see what user the SSIS Service is running under. Go to Start > Run > Type "services.msc" and scroll down to the SQL Server Integration Services 11.0 entry. Right click and check the properties to find out what user it's running under. The second tab should be the LogOn tab. Since you're just running on a local instance, you can set your user as the LogOn User account and SSIS will have the same permissions that you do. Lost a day of work on that problem. My package has a .NET script task to copy file from a shared network folder to a local folder and I was stuck with the "access denied" exception every time I tried to execute the package from the server (Through SQL Studio). The package works fine when running locally. Tried many things picked up here and there and at the end of the day what worked is to create a Job (owner is sa) which execute the package as SSISExecutor. I have to mention that the file on the network has read access for everyone, and that I still don't understand what was wrong. Not the answer you're looking for? Browse other questions tagged sql-server ssis or ask your own question.